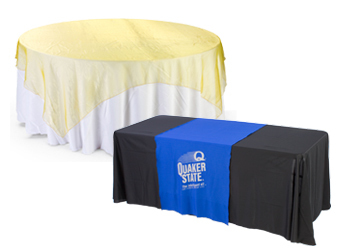 Table skirts for trade shows, tablecloths and covers are customizable throws and runners for hospitality, expo or wedding use are offered at discount prices. 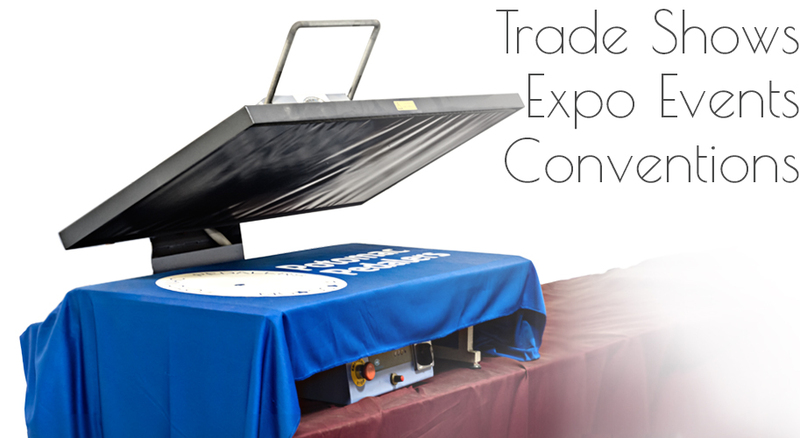 Our company sells these products in two basic categories: custom trade show covers and banquet tablecloths. What is the difference between the runners and covers in each category? In a single word: selection. 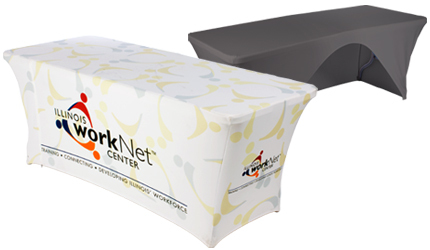 Table cloths designed for trade shows are sized to fit the 4' to 8' tables commonly seen in large exhibit halls. These throws are sold in several colors including green, red, blue, black, and white and may include custom printing of logos, slogans, and other images. 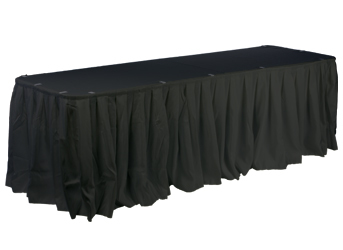 The black table skirts designed for banquet halls are available in the same rectangular sizes but include round styles, as well. These tablecloths are available in a larger variety of colors such as dusty rose, hunter green, burgundy, and gold as banquet halls often cater to weddings and other special events for which the customers desire coordinating linen colors. Our cheap table skirts, as linens, are fabricated from fine quality fabrics to make every venue look spectacular! 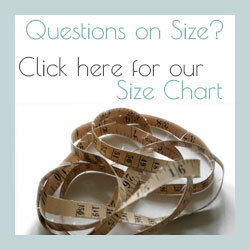 With many styles to choose from, you may have troubles deciding which is best for you. 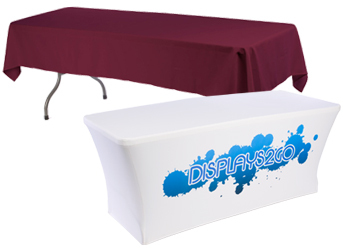 Customizable table throws enhance the beauty of banquet halls and the professionalism of trade show exhibits. 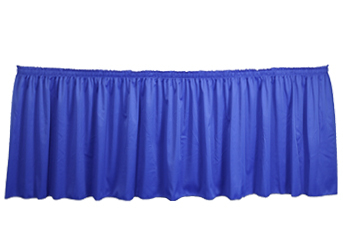 We are the Internet's home of quality tablecloths sold at unbelievably low prices! 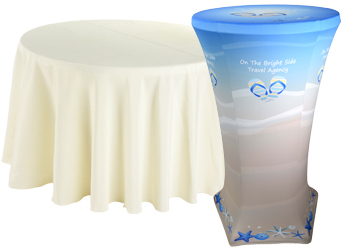 What type of customization is possible with our trade show table skirt? Several options are available for the creation of a custom tablecloth that will increase the exposure to a company name, logo, web address, or slogan. The simplest option is the one, two or three color heat transferred table throw. Using this process, custom messages may be printed on a tablecloth or runner in order to draw extra attention to an exhibit. If you choose to print simple text, we offer 24 hour shipping on these items (when ordered by 2 p.m. EST.) For more elaborate images we need a little more processing time. This same heat transfer process is also used to process more elaborate designs. Standard printing colors are available. The imprints affixed through the heat transfer process are very durable and withstand many washings. The throws may be ironed, but from the reverse side. Dye-sublimation is the second option. This process allows for full-color imprinting on table throws and is perhaps the most effective method to use to customize a table cover. Special rules apply when ordering dye-sublimation that are viewable on each product page for which this process is an option. This process includes color-matching services so the end product will look just like your original graphic design! 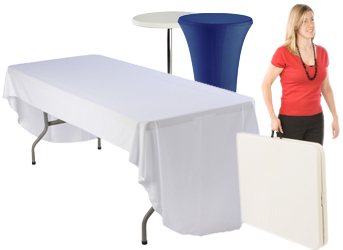 Table throws and covers are simple items that make a huge difference in banquet halls, trade shows, job fairs, craft and art shows, and other venues. 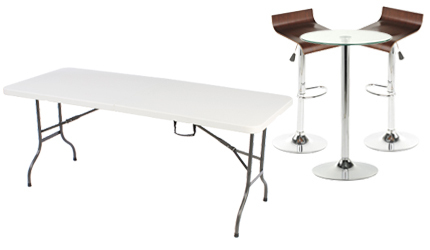 They allow for the covering of tables, which hides imperfections in the tabletop. Drapes also hide the legs of the table and give a room a more "put-together" look. If setting up a large room, the coverings should match or at least be of coordinating colors. For this reason, we offer bulk pricing on our cheap skirts. Check out these low prices now! While a trade show decorator provides a single color for the entire venue, individual exhibitors are not as happy with this conformity. Who wants to blend in with everyone else? Not the avid marketer. The smart marketing professional desires to draw maximum attention to his/her display. So, smart marketers do not rely on what a trade show decorator provides. The smart marketing professional brings his or her own table linens to the event. The different colors help to make passersby notice an exhibit. The addition of customization ensures that not only the colors are noticed, but the business name, logo, slogan, or other message as well! 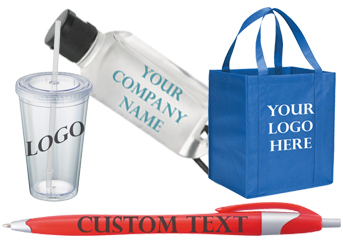 What a cost-effective way to get your products or services noticed at any event! To satisfy the fire marshal, most of our table linens come with a certificate of fire-tolerance. This is important for commercial establishments to comply with fire regulations. 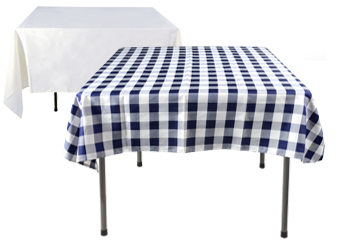 In addition to fire-resistance, most of our tablecloths are also machine washable and dryable. This ensures that these discount tablecloths that are cheap to buy and to maintain. 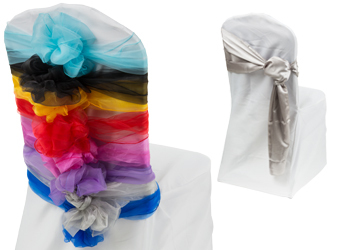 Each item may be ironed, when needed, although the 100% polyester throws are wrinkle-resistant. See a description of all of our product lines on the site directory.